The road to eradicating polio has been a long and difficult one, with Rotary leading the fight since 1985. Going from nearly 350,000 cases in 1988 to just 11 so far this year has required time, money, dedication, and innovation from thousands of people who are working to end the disease. 1. Ice cream factories in Syria are helping by freezing the ice packs that health workers use to keep the polio vaccine cold during immunization campaigns. 2. Celebrities have become ambassadors in our fight to end the disease. They include WWE wrestling superstar John Cena, actress Kristen Bell, action-movie star Jackie Chan, golf legend Jack Nicklaus, Grammy Award-winning singers Angelique Kidjo and Ziggy Marley, Nobel Peace Prize laureate Desmond Tutu, anthropologist Dr. Jane Goodall, co-founder of the Bill & Melinda Gates Foundation Bill Gates, and world-renowned violinist and polio survivor Itzhak Perlman. 3. Health workers and Rotary volunteers have climbed mountains, crossed deserts, and sailed to remote islands, risking their lives to vaccinate children against this disease. Rotary has funded more than 1,500 motorbikes and 6,700 other vehicles, as well as 17 boats, to make those journeys. 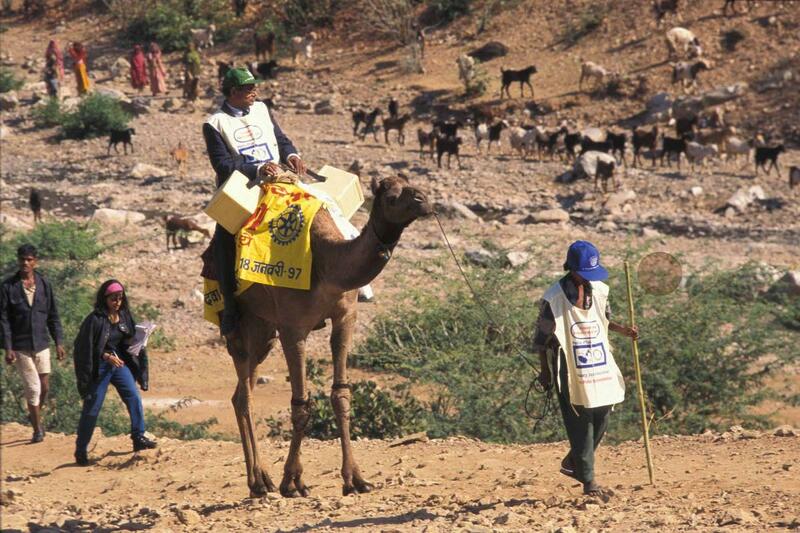 Vaccinators have even travelled on the backs of elephants, donkeys, and camels to immunize children in remote areas. 4. In Pakistan, the polio program emphasizes hiring local female vaccinators and monitors. More than 21,000 vaccinators, 83 percent of whom are women, are achieving the highest immunization coverage rates in the country’s history. 5. Thanks to the efforts of Rotary and its partners, more than 16 million people who otherwise might have been paralyzed are walking today. In all, more than 2.5 billion children have been vaccinated since 1988.